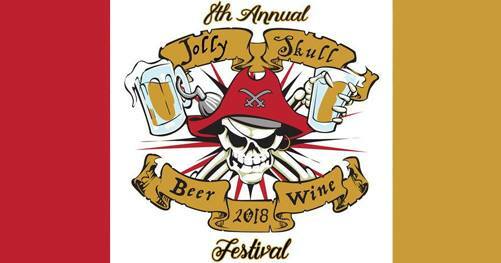 A flag advertising the 2018 Jolly Skull Beer and Wine Festival. A pirate’s skull with red captain’s hat holds a pint of beer in one hand and a frothing mug of beer in the other hand. The flag is bordered by a red bar on the left and a gold bar on the right.